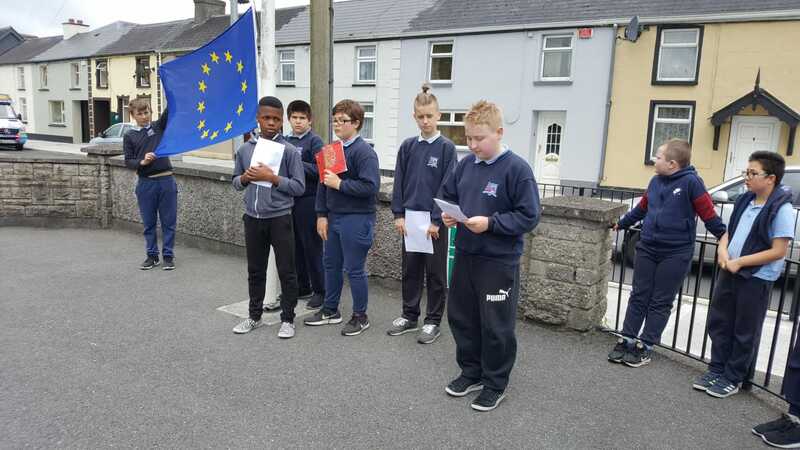 St Michael’s Boys National School, Longford participated in the Blue Flag Programme and this involved learning about the European Union and its workings. This year St Michael’s Boys National School, Longford have been working very hard on the Blue Star Programme. This involved learning about the European Union and its workings. The programme consisted of five elements: historical, geographical, cultural & creative, institutional and the school’s European Celebration Day. Under these headings children got to link different subjects and topics and see how they all fit together within Europe. The children used the internet to research and explore information about the history of the EU, and why it was formed. They used this information to create projects on each member state of the EU. They also researched, explored and debated the pros and cons of Brexit and how this was going to affect both Britain and Ireland. Within these projects the children explored the history, flags, population, music, culture, currency, landscapes and famous people of these countries. Irish MEP Luke ‘Ming’ Flanagan was invited to visit the school and speak to 4th, 5th and 6th classes on the workings within the EU. The children asked him questions on his day to day life in politics. MEP Flanagan explained how laws are discussed and passed in Europe. The benefits of being part of the EU and what it means for us was also discussed. St Michael’s BNS' work on the Blue Star Programme concluded on Europe Day, Wednesday, May 9. The day began with the semi-finals and final of the ‘European Cup Competition’. After lunch all the classes gathered in the hall and presented projects on their selected European countries. Children, parents and teachers baked and cooked foods from other countries and once the presentations were over all children got the opportunity to taste foods from these countries. The pupils really enjoyed this and were delighted to be able to show off foods from their own countries to their friends. Overall, this has been a hugely beneficial and enjoyable learning experience for the pupils involved and it has provided the school with some excellent moments throughout the year. St Michael’s BNS were delighted to raise their first Blue Flag on Monday, June 18.